A hard-hitting specialized anthology written by military veterans selected by armed forces veteran and New York Times best-selling author John Ringo and Hugo-nominated editor Brian M. Thomsen. Science fiction legends - and citizen warriors, military veterans all - deliver science fiction military adventure tales on a grand scale in this star-studded collection. Legendary science fiction writers - and citizen warriors - deliver science fiction military adventure tales on a grand scale. Asimov, Heinlein, Clarke, Laumer, Wolfe, and other greats. Giants of science fiction. Plus all new fiction by recent vets who have served in Iraq and Afghanistan. Military veterans all. This is the Book of Dreams for anyone who enjoys military science fiction. Gritty takes on future combat. Penetrating looks into the warrior's character, the harsh reality of a life under arms - and how society deals with those it desperately needs and often fails to honor as it should. Genius-level storytelling at its very best - introduced and edited by multiple New York Times best-seller and U.S. Army veteran John Ringo and noted scholar Brian M. Thomsen. USA Today and New York Times best-seller John Ringo is the author of the landmark Posleen Wars military science fiction series, the Legacy of the Aldenata series, and the Ghost military action-adventure novels. He also co-authored with David Weber the best-selling Prince Roger science fiction series. A veteran of the U.S. Army 82nd Airborne, he brings first-hand knowledge of military operations to his fiction. 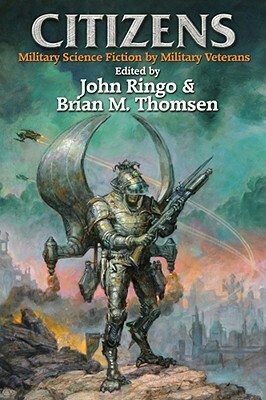 Brian M. Thomsen was nominated for the Hugo Award for best editor and was the author of two novels, many nonfiction books, over forty short stories, and the editor of fifteen anthologies.